Charging up: A file photo of REC chairman and MD A.K. 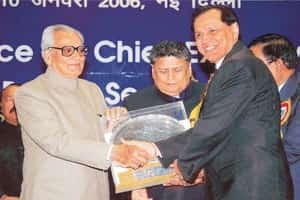 Lakhina (right) receiving an award from then vice-president Bhairon Singh Shekhawat (left). Lakhina will also be heading the company’s new entity. “The company was incorporated in July and would also take care of the decentralized distributed generation power projects along with providing (consultancy) for third-party quality and audit inspections for government-funded projects at a fee (2% of the project cost)," a senior government official, who did not wish to be identified, said. Until now, REC has been associated with the power distribution sector only by way of a funding agency, but with this development, it will compete with other power distributors. “The new company will develop, construct, own, operate, distribute and maintain 66KV and below system and lines, and is targeting a turnover of Rs1,000 crore by March 2008," the official added. The move is aimed at improving efficiency in distribution. The new entity has A.K. Lakhina as its chairman, who is also the chairman and managing director of REC. The subsidiary will draw from the REC pool of workforce and will have a flexible manpower policy. An analyst called REC’s entry into power distribution “a positive move". “As its primary objective of existence for rural electrification would be substantially met by 2009, they would be diversifying into distribution, which was paralyzed due to political interventions. With central management, we expect better collection efficiency due to de-localization of more circles," said Abhishek Puri, an analyst with ASK Securities. REC Distribution Projects Co. will kick off operations with consultancy work. Its first consultancy clients will be the state power distribution companies of Rajasthan and Haryana. But the newly floated firm could face competition. “We feel that they (REC) would have to compete with other private players, as the circles have lately been awarded on a competitive bidding basis," Puri said. Another area the new unit could dabble in will be audit of ongoing projects, which are mostly government-funded. The power sector is set to witness investments of around Rs10.31 trillion, of which the Central and state projects alone require Rs8.13 trillion. Funding of such projects requires audit to keep out discrepancies in project milestones. Such audits are not a norm today and REC Distribution Projects Co. expects to address this need. REC disbursed project funding to the tune of Rs15,000 crore last fiscal year and plans to touch the Rs40,000 crore mark in fiscal 2008. Together with Power Finance Corp. Ltd, it accounts for 60% of all money loaned to the power sector. The lending major has already filed its draft red herring prospectus for an initial public offering with market regulator Securities and Exchange Board of India for sale of 156 million equity shares, equivalent to 20% of its paid-up capital.